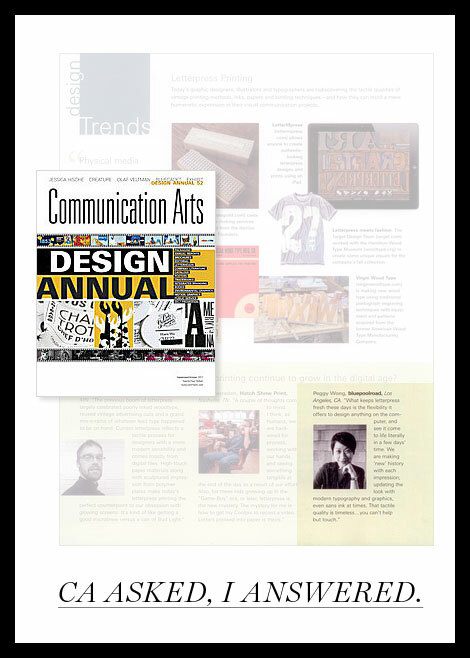 ... incredibly honored to be asked by the editor of communication arts to contribute to their design trends column in this year's design annual. and in good company too – with hatch show print and studio on fire alongside. the question is, "why does interest in letterpress printing continue to grow in the digital age?" coming from a pure designer's standpoint, my answer of course has to do with the ability to see designs come to live in just a few days' time. we are making 'new' history with each impression; updating the look with modern typography and graphics, even sans ink at times (did you know my favorite is this?). that tactile quality is timeless... you can't help but to touch. so i ask, why does letterpress interest you? as a stationery lover, art collector, or design enthusiast? Letterpress feels like a timeless process and one that withstands changes in preference and technology. Rather than merely visualizing a creation, in letterpress, everything can be touched. From the initial design to the results, the senses are involved. Creating a plate somehow feels more permanent than saving a digital file. And when a plate creates an image as it is pressed into paper, the result is everlasting. Jen - I totally agree with you. I was just thinking about how I really prefer reading books over reading via a tablet or digital reader because I love dog-earring pages and making notes in the margins. I think letterpress enhances the tactile sensation for paper lovers. And I love how Studio on Fire is stretching the boundaries of conventional letterpress. There's something very personal with letterpress. It's like a photographer in the dark room- hands on & connecting with your art. It's nice to have something tangible to hold onto and be proud of. there is something very comforting about a piece of letterpressed paper. it is soft and thick and handmade...everything that email is not.